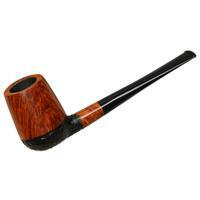 Mogens 'Johs' Johansen lives and works in Frederikshavn, Denmark and makes about two thousand pipes each year. 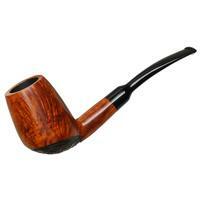 Many of his shapes may seem familiar, and this is because he carved many pipes for Bjarne. After Mogens drills the tobacco chamber, mortise, and airway, he fits a preform vulcanite or acrylic stem (each having a tenon turned on them, though some are fit with a separate tenon) and works insanely fast, which is part of the reason that his pipes are so affordable. 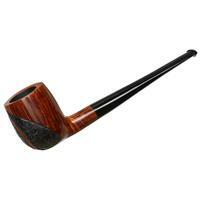 Many of his shapes are variations on Danish Billiards, Brandies, Dublins, and Freehands, which could be finished either smooth, sandblasted, rusticated, or a combination of these textures. 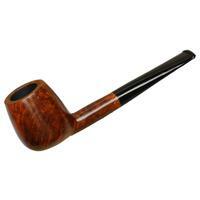 Spot carving is often employed on smooth pipes to cover a flaw, while retaining the beauty of the grain. 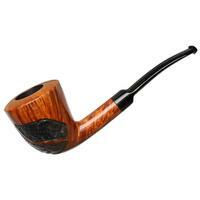 The price simply can't be beat for a handmade pipe.